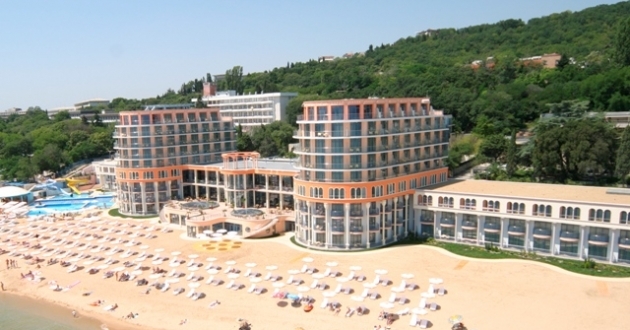 Location: The hotel is situated directly on the beach. Built in 2004. Accommodation: 250 double rooms and 2 suites, all with sea view, equipped with: Sat-TV, mini-bar, telephone, air conditioning, WC/bath-tub, hairdryer and balcony. In the hotel: Main restaurant /200 seats/, special a la carte restaurant /55 seats / lobby-bar, barbecue, night club, outdoor and indoor swimming pools, snack bar by the pool, fitness center, Jacuzzi, hairdresser's saloon, volleyball, billiards, table tennis, children's playground, Internet club, modern SPA&Wellness center, sauna, massage, conference hall, currency exchange desk, shops, safety deposit boxes, emergency medical center, parking area. SPA facilities: Mud applications, using Varna Lake source, electric power treatment (vacuum massage, supersound), hydro treatment (mineral water bath, essential oil bath, herb extracts, pearl bath, underwater massage), sauna, solarium, steam bath, thalassic seaweed therapy, salty water treatment, classical massage and exotic therapies. The swimming pool in the SPA center is with mineral water.